The biological description of the brain as an evolved ensemble of distributed neural networks underlies the significance of applying imaging measures of functional connectivity to clinical research. Our collaborative projects use blood oxygenation level dependent functional MRI (BOLD fMRI) to assess changes in brain networks in autism, ADHD, Alzheimer’s disease, multiple sclerosis, schizophrenia, primary progressive aphasia, and Huntington’s disease; they seek to develop noninvasive imaging-based biomarkers in order to reveal disease mechanisms, improve diagnosis and prognosis, and assess therapeutic interventions. Their studies are limited by the sensitivity and specificity of BOLD fMRI acquisitions. The overarching goal of this TR&D is to work with our collaborators to enhance the sensitivity and specificity of their functional connectivity measures by developing novel empirical Bayesian analysis approaches that exploit two ongoing transformations that are dramatically improving the acquisition and availability of fMRI data, namely simultaneous multi-slice (SMS) MRI, and the availability of large public datasets. Intrinsic visuo-motor connectivity correlates with social deficits in children with autism. 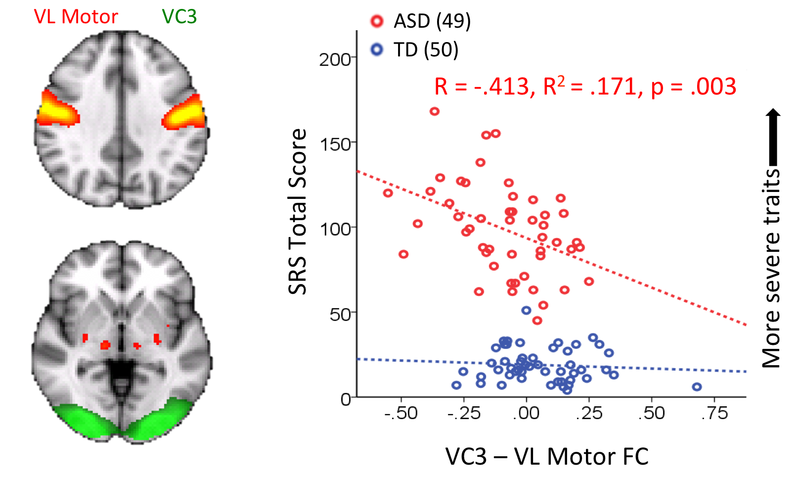 Increased functional connectivity between a visual network (green) and a motor network (yellow/orange) associated with decreased symptom severity, as measured by social responsiveness score (SRS), a teacher and parent rating of social behavior, in children with autism. Brain networks were estimated from resting-state data using independent component analysis. Functional connectivity between the ventrolateral motor component (one of two motor networks found) and the third visual component (of three) was associated with social responsiveness score. Connectivity between networks correlates with attentional control in children with ADHD. Functional connectivity between the Default Mode Network and the Anterior Cingulate Cortex (a node of the Cingulo-Opercular Network) is associated with within-subject variability in response time, a marker of attentional control, in children with ADHD. Typically-developing (TD) children displayed an opposite relationship between DMN-ACC connectivity and response time variability.